Rapidly expand your remote capability with the award winning Merlin PLUS and manage up to 6 bidirectional mono connections with IP codecs or smartphones using Report-IT, saving money on codec hardware costs and reducing studio rack space requirements. Up to 6 simultaneous bidirectional mono remote connections. 2 x Bidirectional mono or stereo remotes, each with separate bidirectional IFB communications channel. Streaming multiple algorithms simultaneously at different sample rates and bit-rates over a range of connection transports. 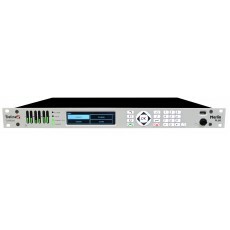 It has dual Gigabit (10/100/1000) onboard Ethernet ports, dual redundant power supplies, audio silence detection and IP network backup solutions to ensure you’re always on the air. An automated network failure detection feature provides switching to a backup IP LAN connection. You can also fail over to backup ISDN or POTS connections as required using optional ISDN or POTS modules. Some other manufacturers charge thousands of dollars for IP management software like SmartStream PLUS as if it's an optional extra. However Tieline believes high performance and STL-grade rock-solid reliability is an essential part of each and every broadcast, and delivers its renowned SmartStream PLUS as standard in Merlin PLUS. Many broadcast networks are transitioning to IP but still require connectivity over ISDN or POTS. Tieline Merlin PLUS codecs deliver flexibility by allowing you to connect over ISDN, POTS or IP networks as required. Simply purchase optional ISDN G5 or POTS G5 modules, insert them in the codec and you are ready to connect over ISDN, POTS or IP on demand. Click here to learn more about Tieline ISDN options. Merlin PLUS supports both IPv4 and IPv6 (Dual Stack) protocols, so broadcasters can be assured that they have made a smart investment for the future as new networks and technologies emerge over time. Connect over IP with any SIP-enabled IP codec brand that supports the EBU N/ACIP tech 3326 standard, as well as VoIP telephone devices supporting G.711 and G.722. Merlin PLUS is also compliant with I3P EBU334 requirements for interoperability of AoIP production intercoms. Merlin PLUS is capable of 16-24bit 22kHz low latency linear PCM audio at up to 48kHz sampling and features aptX® Enhanced, LC-AAC, HE-AAC v1 and v2, AAC-LD, AAC-ELDv1 and v2, Opus, MPEG II, MPEG Layer-3, Tieline Music and MusicPLUS, G.722 and G.711 algorithms. Merlin PLUS supports up to 6 simultaneous streams of Opus encoding. Analog and Digital (AES3) inputs and outputs: Up to six channels of balanced audio in/out via XLRs and DB-25 audio expansion connector (analog or digital AES3). 6 Simultaneous bidirectional mono remote connections. 2 Bidirectional mono or stereo remotes, each with separate bidirectional IFB communications channel. SmartStream PLUS dual redundant IP streaming.